this day in crime history: april 9, 1934 | Nobody Move! 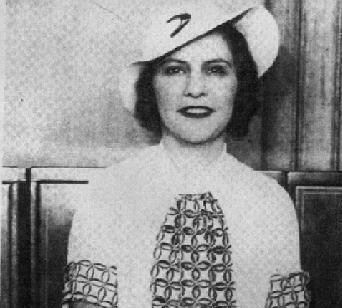 On this date in 1934, John Dillinger’s girlfriend, Evelyn “Billie” Frechette, was arrested by G-men in Chicago and charged with harboring a fugitive. An angry Dillinger vowed to break her out of jail, but a girlfriend of one of his gang members talked him out of it. He did pay for her legal defense, but she wound up being convicted anyway. Billie Frechette spent two years in federal prison. When she was released in 1936, she toured the country in a theatrical show called Crime Doesn’t Pay. Several members of Dillinger’s family were also featured in the show. I guess sometimes crime does pay after all. —At least she made good on her time in jail. And didn’t go back to crime (like so many tend to do today).